Wes Ellis: Which Jesus Should We follow? Which Jesus Should We follow? It seems that your vision of Jesus can be greatly manipulated by how you expect Jesus to return. It would seem that someone who expects Jesus to return on a white horse wielding a great sword would have some inner conflict with the principals that Nouwen is teaching--principals of downward mobility, those are embodied by Christ on the cross. People who expect Jesus to come with great power and relevance might have trouble accepting that following Christ means the opposite. In other words, people who expect Jesus to come in a fashion opposite of that in which he came the first time might have trouble following the Jesus of the gospels. Which Jesus should we follow? The book of Revelation should seem quite ironic to us... but that irony is often lost on those who insist on taking it literally. In chapter 5 the angel says "look, the lion" and so we expect a lion. But what is actually there? A lamb, and a slain one at that. How ironic. But some of us still expect a lion. We look around the lamb, hoping that a lion is really on the way. The true victory of Revelation, indeed the true victory of God is not through conquest, not through relevance, popularity, or power but through a slain lamb--a poor homeless man from Nazareth who died on a Roman cross. That's it... that's the victory! The fullness of God (that means all of God, which means we need look no further to find God) was dwelling in that man! What a wonderful mystery! Perhaps we can only know it when we see it. "For in Christ all the fullness of the Deity lives in bodily form" (Colossians 2:9). "Your attitude should be the same as that of Christ Jesus: Who, being in very nature God, did not consider equality with God something to be grasped,but made himself nothing..."(Philippians 2:5-7). Therefore being part of that victory means embodying it, living it out, implementing it by being the body of that poor man from Nazareth. It means doing small things with great love. It means putting others before us. It means resisting the temptation to be fearful and to act out of fear when it seems like we're losing control. Indeed, being out of control is the Christian's state of residence. We can only catch the irony of Revelation--that, knowing the Jesus who rode on a Donkey, the white horse description is humorous--if we can understand that ALL of God was in Jesus of Nazareth--God is like Jesus. When we've internalized that truth then all our eschatological expectations will conform to it as well. We will truly have the freedom to embody the crucified Christ rather than a king on a white horse, because the whole mystery of God is revealed in him and all the world's hope for the future is wrapped up in him, just as he is. We can truly embrace a life of downward mobility. The Christian world has followed the blindness of Ancient Israel who were looking for a Messiah to fit their practical needs, and missed Jesus coming. The church is doing the same. They want a "Jesus" to come and get them out of here and escape the earthly events. Well Jesus said that His coming would be as in the days of Noah???? What is this? Noah and his family were not "raptured" of the earth, When the trouble came they were protected, So shall it be again. The redeemed will be protected in the midst of trouble. Read Revelation 12. What's interesting about that "as in the days of Noah" verse is that people usually think of being swept away as a good thing, like those who are swept away will be saved from "the tribulation." But being swept away was a bad thing in the context of the flood... it meant you drowned. Just an interesting thought. Thanks for your thoughts. I'll check out your site. Wow. You're more liberal than me. I don't think I'm with you on the eschatological interpretation here, but I'm sure with you on the practical application of it. I've only been on 3 pages on this blog of yours, but I love the feel of it. My eschatology basically consists of, "I better keep an open mind because it's certainly going to be different than whatever I figured out." It's a lot better to actually recognize him when he comes than to have figured it out in advance. Ask the Pharisees about that. Thanks for the comment. I'm not quite sure what's liberal about my perspective here... I'm just trying to look to the gospels to find out what Jesus is like (and thus, what I should expect from Him) that seems kinda conservative to me. But as you said, eschatological open mindedness is very important. But at the same time, its important to have some clarity about just who it is we are worshipping. I hope the liberal comment wasn't insulting. I do not have "liberal" and "conservative" figured out; the comment about your post being liberal was tongue-in-cheek. 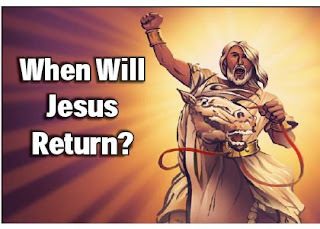 Without my tongue in my cheek, what I was saying is that suggesting that Christ is not coming back on a white horse pouring out vengeance is pretty daring. Being a church history buff, I don't think it's very historical, either, but ... the attitude you espouse in this post is most definitely the one we're supposed to live with. On top of that, the "historical" interpretation of the prophecies of Christ's first coming didn't prove real accurate when he came that first time. You didn't really need to explain yourself. No offense taken. Thanks for clarifying though. I appreciate your comments.